Cluster Balloon Launch, August 31st 2008: "Blueberry Cluster"
It starts in the dead of the night-- as these long-distance cluster flights tend to do. 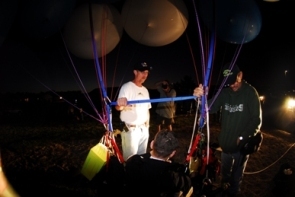 It is safest to launch any balloon system near sunrise or sunset, when winds are at their most calm. 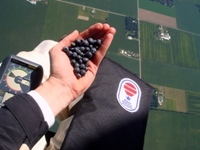 Gas clusters can be used to make little ‘hops,’ but I prefer to fly them like the gas balloons they are-- for long flights. Since launching at sunset for a long flight would have me flying into the dark of night, it means we must launch at sunrise. So our crew came together in the very early morning. The festival organizers, the helium sponsor, reporters, friends, balloonists -- we all came together at the launch field at 4:00am. I tried to console the participants with the fact that this was an hour later than the meeting time for our last cluster launch! This information had little effect. It’s amazing to watch a group of dedicated volunteers transform a gravel lot into a gas balloon launch field. The guys from the gas provider, All American Welding, were really skilled in dealing with the heavy helium cylinders. They had 38 bottles off the truck and into inflation stations within 30 minutes! We did a demo inflation of one cell then broke our crew up into teams with members inflating at each station simultaneously. Ah, and the morning came alive! 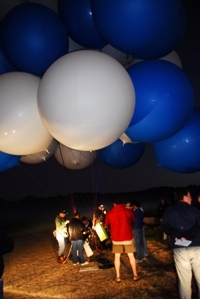 It no longer felt like the dead of night-- we had people working diligently, laughing, moving that precious gas from the boring steel cylinders into the glorious light balloons! 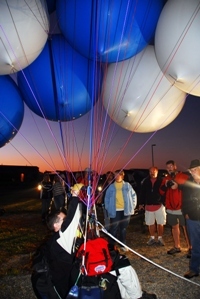 We were joined on the field by the local police and the FAA designated balloon pilot examiner for Michigan. It was an honor to have them helping with the system! With the team we had, the cells were inflated by 5:00am. Now the assembly of the cluster begins. Ballast bags clipped on to the gondola-- about 100 liters of water. Gondola is tied off to a vehicle. Balloons come together-- top tier first. Then the middle core tiers. 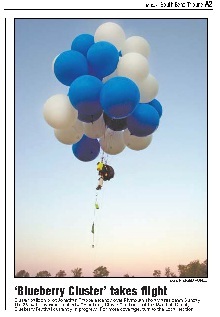 Each balloon is brought in by volunteers one at a time, clipped into the system, checked by experienced crew. The system came together beautifully. In fact, it was together by 6:00am. A really great reporter from the South Bend Tribune is chatting affably, getting some background for his story. There are bells ringing in the distance-- Sunday morning church bells. The system is laden with gear-- transponder, ballast, radios, tracking beacons, parachute, oxygen. Someone jokes that they thought they had a lot of stuff-- and they have a whole basket to keep it in! Me, I’m just in my little harness-- and I hope to be aloft for many hours. I’m 22 miles from the South Bend airport, with its Class ‘C’ airspace. I’m 42 miles from Lake Michigan. Both are within easy range of this gas flight. We can call South Bend to let them know we’re coming. Lake Michigan, however, won’t care if we’re coming. We had actually been talking with South Bend ATC for over a month. They had given us permission to overfly their airspace, provided we were transponder and aircraft radio equipped, which we were. At 6:01 am I was calling the tower to remind them of our launch, to get an aircraft radio frequency to monitor, and a discrete code for my transponder. As ATC guys always are, they were very professional and happy to help. At this point, I was essentially ready to launch! By 6:10 am, everything was done-- but sunrise wasn’t until 7:10. So we had an hour to visit with the gathering crowd, talk about the flight plan, the way the system flies, my intended destination. Oh, yes: intended destination. 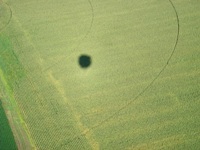 Part of the excitement of any balloon flight is you don’t know for certain exactly where you will land. You aren’t flying as a method of getting anywhere in particular-- which is one of the great things about lighter-than-air! For the month prior I had been running trajectories. The night before launching we ran our HYSPLIT trajectories again; they were saying I would be heading towards Lake Michigan. (That’s bad.) We had been watching the trajectories for a month-- prevailing winds were never towards that mammoth lake! Well, today they were. We were on the back side of a high pressure system, and the winds were whirling back and around -- and sending anything put aloft to the north west: right to the lake. Take a look at the trajectory predictions above. Before coming to the field we ran a HYSPLIT for every thousand feet, up to 9,000 feet. See the first set, all the way to the left? That is where the wind would be sending me if I flew at 1,000, 2,000 or 3,000 feet MSL. Then move to the next set of trajectories, in the middle. Notice how the higher you get, the more 'left' there is? That is, anything in the first 6,000 feet (first two charts) takes me over the water. Ah, but up at 7,000 I narrowly miss it. (Well, I go straight toward some very populated areas around Chicago, and that is still bad-- but it's not over the water.) 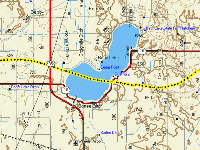 If I kept the cluster low, it was predicted that I would start out heading to the North West towards the lake. This particular day, the winds were more and more 'left' as you got higher and higher -- to the point where one would be going south-- then south east. That was the prediction, anyway. The winds called for a high flight. I made the decision: it was flyable. I had 42 miles before the lake. Sunrise got closer and we moved the system further into the center of the launch field. 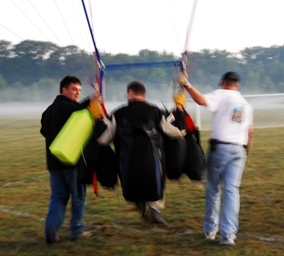 My friend and mentor Troy Bradley has about 5,000 lighter-than-air hours-- in hot-air and gas balloons-- and he was gracious enough to come assist with the flight. This morning he would do the weigh-off; throughout the day he would be below in the chase, with tremendously valuable experience and advice. My friend and aeronautical engineer Mark Caviezel built some of the avionics (like the transponder and APRS units) used on the system, then came out to crew the entire flight. Together we moved the system out to a more open area on the field. 7:08am: all is ready. We begin the weigh off, slowly ballasting. We’re surrounded by about 100 people: friends, crew, and my wonderful girlfriend Nidia. Sunrise was 7:10 am. By 7:12 I am off the ground. Um, about 3 feet off the ground. I was aiming for a very light launch, and we got it! Someone in the crowd joked something to the effect of “I’ve heard of gentle take-offs, but this is ridiculous!” I am essentially neutrally buoyant-- not touching the earth, yet not shooting skywards. I'm just a couple feet off the ground. I float along, up to about 5 feet, and then I start coming back down~ very gentle. I joke that I get to count this as two landings for the flight. Though, before touching, I release ballast slowly-- and I never quite touch the earth. So beautiful and surreal. So many people present, but the most noise seemed to be the clicking of cameras. It is as if everyone was holding their breath. I myself was in awe of the system above me, the system we built that morning. We were launching this beautiful silent Blueberry Cluster. With my ballasting, I got the most gentle of all ascents. The Blueberry Festival and the Marshall County Hot Air Affair were gracious enough to host me, and we wanted to have the cluster system provide a fun show for the participants! That it did-- I did not rocket out of there-- we chatted as I floated. But now I was floating away from the crowd. No longer neutrally buoyant, I ascend gently. Today I was to fly a radio beacon hanging below me, along with aircraft position lights. I ascended up to about 100 feet as I head to the treeline. My friend Troy radios to remind me of the gear suspended below. The gear brushed the tops of the trees as I cleared the field, heading to the North West. I had the system flying level within 20 feet-per-minute. I crossed the Blueberry Festival fairgrounds, as crews were restoring the festival grounds after the previous evening. I was silent; nobody saw me. I looked down and observed, unnoticed. I flew over the city of Plymouth as the morning sun broke. The hot-air balloons behind me were starting up, and I saw the first balloon-- the ‘hare’ balloon that the others would chase-- launch from the field. There, you can see in the photo to the right-- the hare is lifting off down below, on the right side along the horizon. So, I climbed up, and up-- above those winds. Just as the HYSPLIT forecast, as I climbed there was more and more 'left'. I got my nice hook. I looped back over my previous track, and started a leisurely stroll to the south. To get the track I wanted, I took the system up high-- very high. 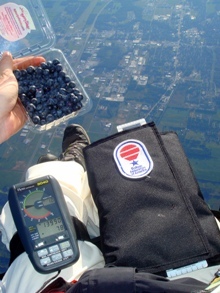 The event hosting my flight was the Blueberry Festival, so I couldn’t help but take blueberries aloft with me. I was controlling my climb and I was at 13,990 feet, with Plymouth right down below me. And I snacked on some blueberries. My speed was on the order of...2mph. 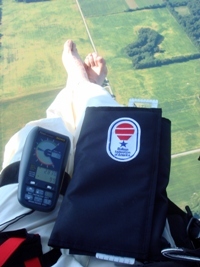 My crew below had a visual on me, and they were receiving telemetry once per minute: location, altitude, speed, direction. They knew I wasn’t going to get away. So, they went for breakfast! I had a great track to the south, gentle airspeed, and wonderful control of the cluster system. Consulting my sectional, and conferring with crew on the ground, we reconfirmed that there was open airspace for many, many miles ahead of me. No active military operation areas, no restricted or prohibited airspace. I brought the system up very high-- stopping just before 18,000 feet to stay clear of the Class A airspace. The speed and track at this rather exceptional altitude was just fine. 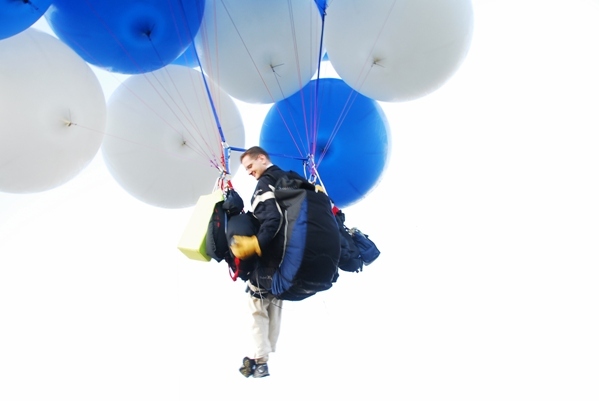 I flew the balloon system right up against the maximum altitude appropriate for this flight. I watched my altimeter closely in this range. As I climbed up through 17,900 feet, I was breathing from my oxygen system, and was prepared to stop the climb. It was time-- I let a cell off the top of the stack, and the system peaked at 17,930 feet. I piloted the system slowly back towards the surface. It was pretty darn cold up in the thin air, and pretty warm down near the surface! I released water ballast to have a slow descent-- and I got my feet pretty wet. It’s ok-- later in the flight I could take off my shoes, clip them into the system, and hang them out to dry. Imagine that: shoes hanging to dry at 10,000 feet. You think I joke? No, no. I’m serious. I call back down: “Ahoy down there, with no balloons!” I had never been 'ahoyed' before. When I was again near the earth, I started tracking back to the north west-- back towards Plymouth and (eventually) the lake. The flight plan today called for two options: land before the day heated up and thermal activity started, or fly high above the thermals until the heat of the day broke, terrestrial radiation waned, thermals calmed, and it would again be safe to land. Consulting with my crew, I made the decision to fly on. 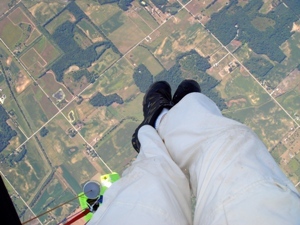 The day would see me back up above 10,000 feet two more times, in giant, gentle parabolas. It’s worth taking a moment to discuss the view. Should you need a proper description, we will have to consult a poet. My skills in language are inadequate to describe the tremendous beauty. In the gps track you can see how I tracked across Bass Lake; I watched the people relaxing on their boats, water skiing, enjoying their holiday weekend. Just like floating over the festival grounds earlier in the day, I don’t believe any of those on the lake were aware of me floating above. There was no sound to alert them to my presence, and flew the system quite high over the water. I watched the boats leave wispy white trails as they crossed the lake. I left no trail across the sky. 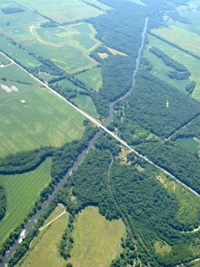 I crossed rivers of deep blue andwinding rivers of bright green. 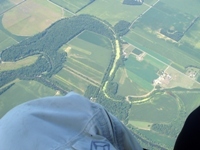 My flight at this point was gentle, above open country, in clear airspace; I'm relaxed. The relaxed part came to an end. I took the system down towards the surface, and things started picking up-- with a right-hand turn that was bad. Just as the Hysplit models had predicted, there was a turn as the day progressed. With these winds I was given these flight track options: fly low, track to the busy Northern Indiana shoreline, followed by Lake Michigan; or fly high straight to Chicago. Yet it wasn’t quite the optimal time to land either. It was late afternoon-- for calmest winds I would need to wait until sunset. I started to search for better winds-- some winds that would track me away from the two hazards looming. I had piloted the system down to within a couple hundred feet of the ground, and the track was no good. So I made the system climb-- 1,000, 2,000 feet. Nothing better-- and I’m climbing too slow. If I search for winds at this rate, and they're all bad, I’ll be over the danger areas before I can confirm that there are no better winds. I drop precious ballast to get a sharper climb going. Through 5,000 feet-- nothing better. While keeping the climb going, I get on the aircraft radio to Flight Watch to get forecast winds. 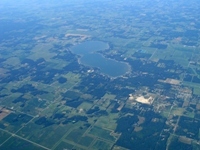 I ask for winds up to 18,000 feet-- is there some narrow band that will get me a turn, away from the city and lake? They are predicting winds aloft doing pretty much what they are doing now. I’ve personally scrubbed the weather-- by climbing through the sky searching for something better-- I’m up at 12,000 feet. Winds are consistently to the North West aloft. There is no relief to be found here. Now I am flying very high, and flying straight towards highly populated areas where landing will be more difficult and dangerous. And, it isn’t going to get better-- I’ll be over the city, over the lake-- into the night-- all bad. 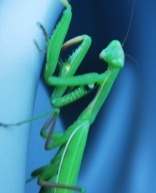 I need to bring it down and land before the urban areas blanket the world below me. And I’m at 12,000 feet-- needing to be at the surface. 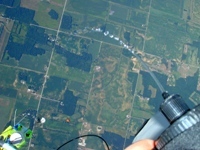 I initiate a sharp descent, peaking around 700 feet per minute. 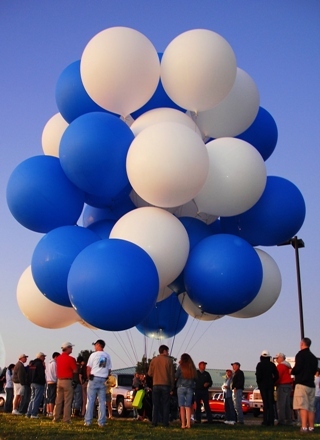 Let’s be clear, Cluster Ballooning is beautiful, inspiring, and delightful. It is also very serious. 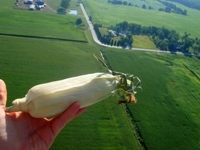 Don’t try this without a pilot’s license and FAA certified training. Really-- you need the tools you learn in flight school, and from flying experience, to safely deal with situations that can arise. These are things that can be taught and learned-- so please do fly-- but take the training first. I’m most the way to the surface. I’ve got my ballast ready-- if I need to abort a landing, I can rapidly drop ballast and fly to another site. 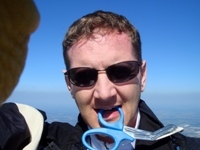 I have my shears ready for the opposite reason--when I am committed to a landing site, I need to be able to cut cells free and stick that landing. I don’t want to drag for 200 yards. I needed down-- I got it. Now I cut an entire bag of ballast. No time to drain it. It falls, clear of any people or structures, and ruptures catastrophically upon hitting earth. That does it-- I flare. I would ascend now, having dropped so much weight. I’m at treetop level, with a backyard in front of me. No, I’m not climbing again-- this is it. This will be good enough. I’ll take it. *woomp. * One bounce. Move 3 feet. Come to rest. Well, that was a smooth ending to a stressful final 30-minutes of flight! A wonderful bump-landing, cells rolling free-- I call to my crew “landed, landed-- I’m not injured.” They are with me so soon, running across the ground, closing the distance ready to help. Thank you, to everyone who put this system skywards. I was lucky to be in the pilot’s seat of the system you created, built, sponsored, guided, guarded, and welcomed back home. Nidia Ruiz Ramirez; Troy Bradley, Mark Caviezel, Johanna Anim-- dedicated crew and friends--- thank you. Jim Kunze, Ron Hodges, Cecil Ottow-- directors Marshall County Hot Air Affair-- thank you. Reporter Ed Ronco-- with gracious and friendly coverage in the South Bend Tribune-- thank you. Reporter and friend Jessica Nunemaker for advance press in The Pilot News-- thank you. Reporter Ryan Klund, photojournalist with ABC 57, for advance coverage on Friday night news-- thank you. Early morning crew and friends-- some traveling hundreds of miles to help on the flight. Thank you. I sincerely appreciate it. 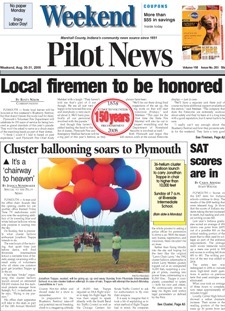 This community of balloonists can do amazing things-- I’m lucky to have been the pilot of your Blueberry Cluster.